The Stormega X by Topway is a third-party controller for the Sega Dreamcast. 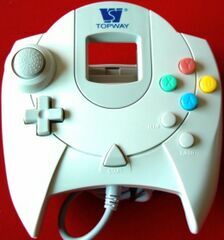 It is effectively a standard Dreamcast controller with two extra turbo buttons. The controller has almost a 1:1 resemblence to its official alternative, which is unusal for third-party Dreamcast products.